Ancient Egypt was a narrow valley that was bordered on either side by extensive deserts. From around 9000 BC, the North African hunter-gatherer inhabitants of the fertile Nile Valley enjoyed the milder post-glacial conditions, domesticating animals and increasing in number. In the late sixth millennium BC farming villages appeared, as did rock art in some of the region's caves, and the following two millennia saw the gradual formation of small states. After 4000 BC, thanks to the sudden desiccation of the grass plains of the Sahara and an influx of people towards the Nile, there was a substantial increase in population, and villages sizes increased accordingly. From around 3500 to 3000 BC there were great and very sudden advances in craftsmanship and technology, which culminated in the working of copper, stone mace heads and ceramics. The first walled towns appeared at Naqada and Heirakonpolis (circa 3300 BC), and were associated with rich tombs, probably the resting places of the rulers of Upper Egypt (to the south). One of these rulers was the first to unite the whole valley, from the first cataract near the Nubian Desert to the Mediterranean, as a single kingdom in about 3400 or 3100 BC. There are two main schools of thought regarding the dating of Egyptian dynasties. The earlier one is used here in the main chart, but a more recent (and increasingly accepted) version is shown where data is available in the left-hand column. There are also other, far more radical theories being proposed which either dramatically length or shorten the timescale shown here. None of them are entirely conclusive or widely accepted. One of the oldest known civilisations in human history, the rulers of Egypt were known as pharaohs (meaning 'Great House'). Many early records from outside of Egypt are Greek in origin, so in many cases the Greek version of names are shown in parenthesis. The archaic period includes the Early Dynastic Period, when Lower Egypt and Upper Egypt were ruled as separate kingdoms, and the First and Second Dynasties. Highly interesting new research that was published in the Proceedings of the Royal Society in 2013 established what was possibly the most accurate timeline for early Egypt. Previous records had suggested that the pre-Dynastic period, a time in which early groups began to settle along the Nile and farm the land, began in 4000 BC. But the new analysis revealed this process to have started later, between 3700 or 3600 BC. By the thirty-second century, Egypt had transformed into two kingdoms, north and south, and these were quickly merged into one. Around 3600 BC there was known to be a kingdom centred around Hierakonpolis in Upper Egypt. Archaeologists discovered one of Egypt's largest funerary complexes in the Kom al-Ahmar region, to the south of Luxor, which probably belonged to this kingdom. According to the experts, the city probably extended its influence northwards, defeating rival entities along the way, especially the smaller but still powerful rival centre in Lower Egypt. This was the process which eventually united the two early dynastic kingdoms in Egypt (see feature link, right). Lower Egypt, the area nearest the Mediterranean, was known as the Black Land, and consisted of the northern Nile and the Nile Delta. The following list is probably incomplete. Upper Egypt was known as the Red Land, and consisted of the southern Nile and the deserts. An early centre of power was at Hierakonpolis, which may have produced the strongest kingdom in the Archaic Period. No names of rulers are known, unfortunately, but the kings here established a large necropolis to the south of Luxor. The following list is probably incomplete, as there are many more names which are of uncertain existence. Upper Egypt was also the site of archaeological discoveries of some of the earliest-known purpose-built boats. These boats, buried for five millennia, are believed to date between the Archaic Period and the 3rd Dynasty. They are probably intended for the pharaoh in the afterlife, and all point towards the nearby Nile. These early boats are the ancestor of the later, grander solar boats which were designed for the same purpose. Oldest tomb at Umm el-Qa'ab had scorpion insignia. Very uncertain. May be same as Menes or Narmer. The Old Kingdom was a theocratic state dominated by a divine king. Belief in life after death was a fundamental religious tenet, and both kings and courtiers built increasingly elaborate tombs to reflect this belief. Mummification was already being practised, from perhaps 5000 BC in its most basic sense (see feature link, right). New research that was published in the Proceedings of the Royal Society in 2013 established what was possibly the most accurate timeline for early Egypt, placing the accession of its first unified ruler at about 3100 BC. The formation of Egypt was unique in the ancient world in that it was a territorial state of the modern type which straight away formed borders. Until now, the chronology of Egypt's earliest days had been based on rough estimates, but with no written records from this very early period, the timeline was based on the evolving styles of ceramics unearthed from human burial sites. The 2013 research used radiocarbon dating of excavated hair, bones and plants alongside established archaeological evidence and computer models to pinpoint when the ancient state came into existence. United North & South kingdoms. According to Herodotus, Memphis is founded as the capital of Egypt by Menes. According to other sources the capital is at the city of 'This' near Abydos, which itself dates back to prehistory. Perhaps the confusion arises from the fact that Menes has tombs at both Saqqara, close to Memphis in Lower Egypt, and at Abydos in Upper Egypt. Important in the unification of Egypt. The Narmer Palette shows the pharaoh Narmer wielding the unified symbols of both Upper and Lower Egypt. Some theorise that Narmer and Menes are in fact the same person; others that Menes had inherited an already-unified kingdom from Narmer; while others suggest that Menes had completed a process of unification which Narmer had begun. The view that Narmer actually succeeded Menes seems to be an older one, and is used here. In 2013, a new timeline for the origin of ancient Egypt is established by scientists. A British team finds that the transformation from a land of disparate farmers into a state ruled by a king had been more rapid than was previously thought. Using radiocarbon dating and computer models, they believe the civilisation's first ruler - King Aha - comes to power around 3100 BC. The first evidence of Egyptian hieroglyphics - already very advanced in form - appears at this time. Ruled a united Egypt. Reigned for 41 years. Djer's reign of forty-one years is perhaps unfeasibly long for this time period, raising the possibility that he dies much sooner and the kingdom collapses, if only briefly. The king rules in name simply because no one else has replaced him, leading later generations to assume that he is alive for this entire period. First to use the title 'King of Upper and Lower Egypt'. Possible usurper. Reigned for 9 years. Little is known about the start of the Second Dynasty. It is possible that Hotepsekhemwy reached office by marriage to a princess, so it isn't known if he was related to the old Thinite line of rulers or not. He is not thought to be the son of Qa'a, but could possibly be his son-in-law. He made offerings in memory of the man and was possibly responsible for Qa'a's funeral. Seals with the name of 'Hotepsekhemwy' have been found outside the tomb of Qa'a at Abydos. His tomb has been identified in Saqqara; the substructure has survived but there are no remains of a superstructure. Many early records from outside of Egypt are Greek in origin, so in many cases the Greek version of names are shown in parenthesis. Possibly reigned for 39 years. Reigned 17 years. Possibly only ruled Upper Egypt. While Sekhemi-Perenmaat seems to be fairly securely recognised as the predecessor of the final second dynasty pharaoh, Khasekhemui, Seth-Perinsen is much harder to pin down. It is likely that he ruled the southern half of Egypt only, while Perenmaat rules the northern half and succeeds to the rest upon Peribsen's death. Possibly only ruled Lower Egypt. Egypt attained its first continuous peak of complexity in its civilisation and achievements with its administration centralised at Memphis, where Zoser established his court. The Old Kingdom is perhaps best known for the large number of pyramids which were constructed at this time as pharaonic burial places. For this reason, the Old Kingdom is frequently referred to as 'the Age of the Pyramids', and for much of its existence, it achieved a remarkable level of stability, not only for its ruling elite but for Egyptians in general. That pyramid culture, according to Dr Robert Lomas of the University of Bradford, could have developed as far away as Orkney to the north of the British Isles. He developed the theory that complex pyramid construction techniques were developed there more than a thousand years years before the Egyptians used similar ideas. He said skills used on the islands from 3800 BC were extremely sophisticated, perhaps spreading from there through Europe until they could be picked up by the Egyptians. To offset this theory, the Neolithic farmer migrations into the British Isles from around 4000 BC would have seen the arrival of people with an Anatolian heritage who had spent two thousand years in Iberia following their journey along the northern edge of the Mediterranean. It is much more likely that they brought with them some form of shared knowledge that eventually led to pyramid building both in Egypt and the Orkneys. Memphis was the capital of the first province (nome) of Lower Egypt, and it became the kingdom's capital, strategically situated as it was at the junction of the Nile Valley and the Delta. Memphis remained a major administrative centre, if not always the capital, until it was supplanted by Cairo in the seventh century AD. 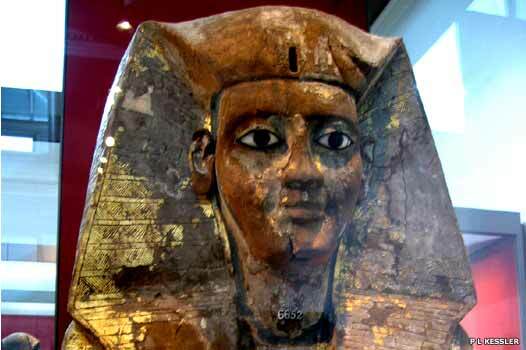 Its original Egyptian name was Ineb Hedj (The White Walls), while the name 'Memphis' was a Greek deformation of the Egyptian name of Pepi I's (Six Dynasty) pyramid, Men-nefer. Egyptian (Greek) versions of same name. Heralded the age of pyramids. The first Egyptian stepped pyramid - the sixty-two metre-high stone-stepped Pyramid of Zoser - is built at the Saqqara necropolis opposite Memphis. The chief architect for the project is Imhotep (or variously Immutef, Ii-em-Hotep, or Imuthes, the latter being a Greek variation). Is this first stepped pyramid to be aligned to the north-finding stars in the way of later versions (see feature link for details). One school of thought on the dating of the early Egyptians and the Israelites suggests that evidence proves that the Third Dynasty (and therefore the rest of the Old Kingdom) is dated too early, with Menes more accurately being placed about 2300 BC. That would allowSekhemkhet to be claimed as Joseph of the Israelites, vizier to the pharaoh, Zoser. However, even this dating places Sekhemkhet about six hundred years before Abraham exists, let alone his descendant, Moses. The fourth dynasty saw the flowering of pyramid construction. Central administration continued to be based at Memphis. Trading links were established with the Canaanite trading city of Gebal (if they hadn't already been established as early as 3000 BC). Son? Mentioned by inference: Khufu is 'third to rule'. Brother? One of the earliest great pharaohs. Construction of the one hundred and forty-seven-metre-high Great Pyramid of Khufu is completed at Giza. However, the pyramid contains several chambers and shafts, some of which are still reluctant to give up their secrets even in the twenty-first century AD (see feature link). The Sphinx is generally dated to the same period, intended to guard the pyramid. However one theory claims that there should be two sphinxes, while another claims that the single Sphinx is much older, and only now is its head reshaped to resemble a pharaoh (see feature link). At this time the desiccation of the Sahara region is increasing. Son of Snefru. Built 2nd Great Pyramid. Mentioned by the historian Manetho. Built 3rd (Lesser) Great Pyramid. Egyptians begin to move into Nubia, importing their culture and setting up trading centres. This would seem to be the same land as that of the kingdom of Punt or Put. Punt is sometimes described as being Libya in Greek texts, but 'Libya' could be used to describe a broad sweep of the North African territories. Instead, Punt appears to lie to the south-east of Egypt, making either Nubia or the Arabian peninsula more likely as its location. The circumstances behind the founding of this dynasty seem to be completely unknown at present, but considering Userkaf's grandfather, he was probably from a secondary line of the pharaonic royal family. Userkaf started the tradition of building sun temples at Abu Sir, just south of Cairo. The resultant complex there is very popular during the dynasty's existence but falls into disrepair afterwards, only to be revived again under the 26th Dynasty. Royal power is in decline and the size of the pyramids decreases accordingly. Regional governors have become so powerful that they treat their provinces as petty kingdoms, and are buried in impressive rock-cut tombs at provincial centres up and down the Nile Valley. This dynasty was founded by Teti, who married Iput, commonly believed to be the daughter of Unas of the fifth dynasty. Under it, there was trade with the relatively newly-established city states of Syria, including Ebla. Towards its end the dynasty descended into uncertainty and decline, as natural disaster combined with social disorder to end the Old Kingdom Period in Egypt. The wives of Pheops I are both named Ankh-sn-Pepi (Ankhesenpepi I and II, otherwise known as Ankhesenmeryre), and the two are sisters. Ankhesenpepi II's son is Pheops II, who reigns following the death of his half-brother. He may serve as supreme king while four successive sub-kings also govern the country, although this is unclear. Coming to the throne at a young age, he may also have his mother as regent for the start of his reign. 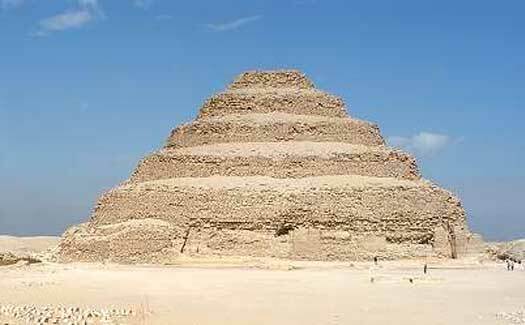 Upon her death, she is buried in a pyramid at Saqqara (see link). Half-brother. Possibly reigned while the next 4 ruled. Reigned for 2 years, 1 month and a day. The First Intermediate Period, beginning around 2200 BC, was Egypt's Dark Age, heralding a period of disunity and relative cultural decline. Traditional thinking says that the Old Kingdom rapidly collapsed after the death of Pheops II. He had reigned for 94 years, longer than any monarch in history, and he died aged a hundred. The latter years of his reign were marked by inefficiency due to his advanced age, and when he was gone the Union of the Two Kingdoms fell apart amid bitter in-fighting to select his successor. Regional leaders had to cope with the resulting famine. In fact, there seems to have been a general climate-induced collapse around this time in the Middle East, as Sumerian cities were also affected in the twenty-second century BC. 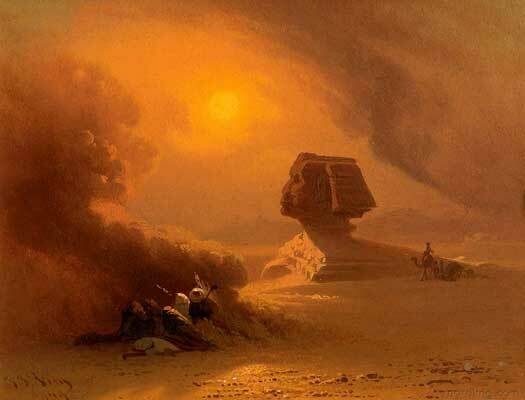 A much more all-encompassing theory about the collapse of the Old Kingdom can be tied to this same extreme climate change event, and the effect it had on Egypt. The event was triggered by the onset of a mini ice age (known to occur in Europe every 1,500 years or so, and lasting for about 200 years). Due to reduced rainfall at the Nile's headwaters, the river suffered a series of low or completely failed annual floods which destroyed Egypt's crop supply. Sandstorms fed by the increased desiccation of formerly green or semi-green areas on the edge of the Sahara smothered the land. The large inland lake known today as Birket Qarun was linked during this period to the Nile by a tributary. When the Nile flood arrived each year, the lake would greatly expand. During the First Intermediate, the lake did not expand. In fact, the lack of sediments for this period show that it died up completely, and all of the previous Old Kingdom sediments were blown away by the winds and the scouring desert sands. This is the only time in its entire history that the lake has dried up completely. Communities in the Nile Delta were reduced to absolute poverty, not knowing where their next meal would come from. Some were reduced to fighting amongst themselves for the smallest scraps, including corpses, carrion, dogs, and waste. 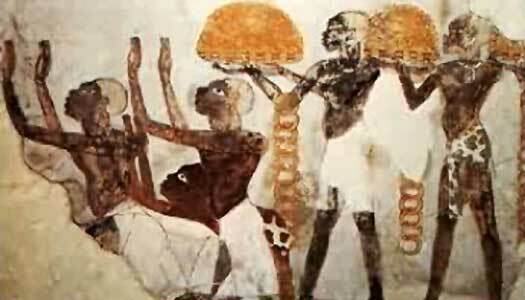 One account, on the walls of the tomb of a local governor named Ankhtifi, relates that people were even eating their children in their desperation to survive. A first-hand account by a doctor who was in Old Cairo in AD 1200 describes much the same thing for another, much more brief famine, supporting the evidence for this earlier famine. The combined seventh and eight dynasties survive as little more than a series of names, and not even all of those are accepted by all scholars as valid pharaohs. After perhaps twenty years of famine and chaos, Egypt is still suffering vastly reduced Nile floods and its people are starving. There seems to be no end in sight of their suffering, and it will be a further century and-a-half before the situation recovers appreciably. Not accepted by all scholars. In around 2160 BC, a new line of pharaohs tried to reunite Lower Egypt from their capital at Herakleopolis Magna, the twentieth nome (province) of Egypt. A rival line based at Thebes was reuniting Upper Egypt and a clash between the two rival dynasties was inevitable. Nomarch (provincial ruler). Founded the dynasty. The Tenth Dynasty continued at Herakleopolis Magna, while Egypt remained fragmented. Only four names are known here, although there is the possibility that more actually reigned. The rulers of Thebes quickly became major rivals for power. The Middle Kingdom can be noted for the expansion of trade outside of the kingdom that occurred during this time, including maintaining a presence along the Mediterranean coast, in Canaanite cities such as Gebal and Syrian cities such as Carchemish. This opening of trade eventually led to the downfall of the Middle Kingdom, induced by an invasion by the Hyksos. However, it was around this time, 2000 BC, that something dramatic was taking place on Egypt's western border. Over a very short time scale - possibly as short as three hundred years - the Sahara Desert went from grassland and low shrubs to arid desert. Summer temperatures increased rapidly and rainfall almost ceased. The loss of agricultural land to the desert may be one reason why the Middle Kingdom flourished along the banks of the Nile, and builds a presence along the Mediterranean coast to its north. The Eleventh Dynasty was based at Thebes (the Greek version of the Egyptian word niwt-rst, 'Southern City') and began as a rival to the Herakleopolitan Tenth Dynasty. In around 2055 BC, Mentuhotep II defeated the Herakleopolitan pharaohs, reunited the Two Lands, founded the Eleventh Dynasty and ruled as Mentuhotep II, the first pharaoh of the Middle Kingdom. Founded the dynasty in Thebes. Son of Iku. Nomarch of Thebes. Claimed to rule over all Egypt. Intef II is the first of the dynasty to claim to rule over the whole of Egypt, which brings the Thebans into conflict with the rulers of Herakleopolis Magna. Intef undertakes several campaigns northwards, and captures the important nome (province) of Abydos. 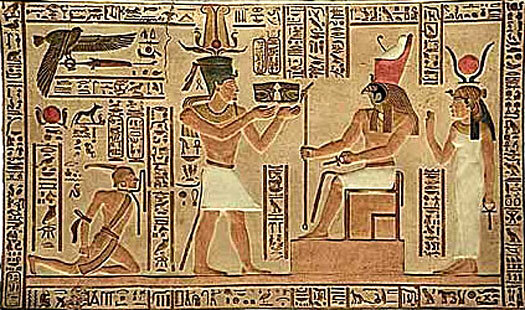 The reunification of Egypt is effected under Mentuhotep II. Nubia is occupied as far as the Second Cataract. The reign of the last king of the Eleventh Dynasty is something of a mystery. 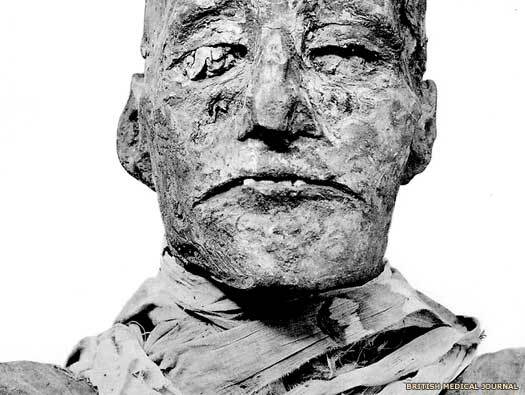 Contemporary records refer to 'seven empty years' following the death of Mentuhotep III, which correspond to the reign of Nebtawyra Mentuhotep IV. Modern scholars identify his vizier, Amenemhat, with Amenemhat I as part of a theory that Amenemhat became king during a palace coup. The dynasty founded a new capital at El-Lisht. 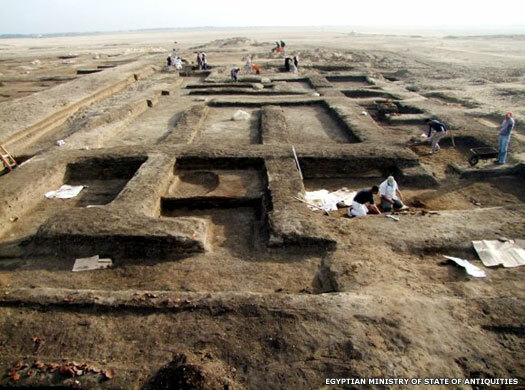 Middle Kingdom rulers were buried in desert-edged pyramids nearby. Vizier of the previous pharaoh. Senusret I officially establishes the southern border of Egypt 'in order to prevent' any people from the Nubian kingdom of Kerma 'crossing the frontier, by water or by land unless for trading or other approved purposes'. Son. Most powerful of the Middle Kingdom pharaohs. The heavily policed Egyptian border is used as a launch pad for a series of raids under Senusret III against Kerma in Nubia. A canal is built around the Nile's first great series of rapids (the First Cataract) near Aswan to facilitate troop movements. The pharaoh launches a series of invasions and boasts of his exploits in the kingdom of Kerma. The horse is introduced into Egypt. Son. Had a co-regency for one year. Queen. Applauded as a national heroine. The Second Intermediate Period is best known as the point at which the Hyksos made their appearance in Egypt, whose reign comprised the Fifteenth and Sixteenth Dynasties. Seventy pharaohs ruled in a disrupted Egypt during this period, and for much of that time, they paid homage to the Hyksos. To the south, the Nubian kingdom was at its height, freed from interference by Egypt. In later texts, this period is usually described as one of chaos and disorder. However, the period may have been more peaceful than was once thought since the central government in Itj-tawy near the Faiyum was sustained during most of the dynasty and the country remained relatively stable. However, the pharaohs were unable to prevent a break-away dynasty forming in the north. Unfortunately it is difficult to ascertain an accurate chronology for this as there are few monuments dating from the period. Many of the kings' names are only known from an odd fragmentary inscription or from scarabs. Reigned for 5-7 years. A well-attested ruler. Reigned at least 4 years and 3 months. Reigned for 4 years and 2 months. Reigned for 10 or 11 years. The Hyksos make their first appearance during the reign of Sobekhotep IV, and around now they take control of the town of Avaris (the modern Tell ed-Dab'a / Khata'na). Reigned 10 years and 8 months. Reigned 23 years and 8 months. Reigned 2 years and 2 months. The position of the following kings is uncertain. The Hyksos, led by Salitis, the founder of the Fifteenth Dynasty, overrun Egypt during the reign of Dudimose I. The provincial ruling family in Xois (Avaris), located in the marshes of the western Delta, broke away from the central authority to form the Fourteenth Dynasty. As a result, some dates overlap with those of the preceding dynasty. The Turin King List provides an additional 25 names, some fragmentary, and no dates. None are confirmed elsewhere, and all are of very dubious provenance. The dynasty was a very-short-lived one, being swiftly conquered by the Hyksos. The Hyksos, Semitic Sea Peoples who based themselves at the Nile Delta, made their capital at Avaris, the captured Fourteenth Dynasty capital. They ruled Lower Egypt directly, and exacted tribute from Upper Egypt, treating it as a subject satellite state. While Hyksos was formerly taken to mean 'shepherd king', modern thinking translates it as 'foreign king', and the Hykos are usually accepted as being refugees from Palestine, although Edom has also been claimed for the source. It is possible that the Hyksos were driven to invade Egypt by the same famine in the Middle East which caused the Israelites to migrate towards Egypt. Hurrians were also beginning to campaign into Syria and the Levant and may have pushed refugees southwards. At the same time as Memphis fell to the Hyksos, the native Thebans set up the rival Seventeenth Dynasty which fought to free Egypt. 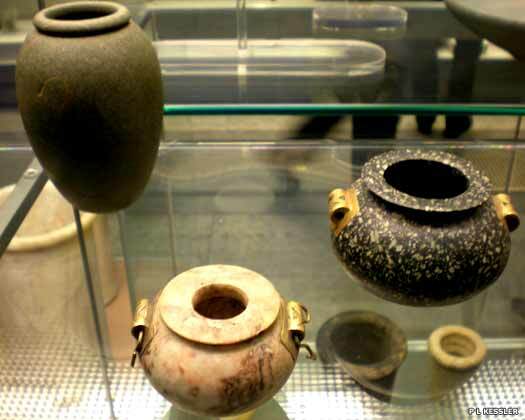 An interesting discovery from the more recent post-communist era archaeology in China is the realisation that much of the nation's Bronze Age technology came from regions outside China. Bronze that arrived in China originated in the Babylonia-dominated Middle East or ancient Egypt. Some of the wilder theories have put this down to an epic migration from Egypt to China, seemingly during the Hyksos period when long-distance seaborne travel was a definite possibility, although the distances involved in this case may have been far too great. A more prosaic consensus is that bronze was transmitted into China from Central Asia by a slow process of cultural exchange (trade, tribute, dowry) across the northern frontier, mediated by Eurasian steppe pastoralists who had contacts with indigenous groups in both regions. However, intriguingly, Sima Qian in his first century historiography, the Records of the Grand Historian, wrote in his description of the topography of the Xia empire, 'northwards the stream is divided and becomes the nine rivers. Reunited, it forms the opposing river and flows into the sea'. This was not a description of the Yellow River, which runs from east to west. The world's only great river to flow south to north is the Nile, with the 'nine rivers' being the Nile delta where it meets the Mediterranean. So far, no conclusive explanation has been provided for this. Named as an early king but position uncertain. Reigned for either 3 or 1 years. May be the same man as Apepi I. This Theban dynasty was a local group based on the north coast of the Sinai (Pelusium), and cover a period of time when Egypt was split into a set of small Hyksos-ruled kingdoms. The rulers were contemporary with the Fifteenth Dynasty. They are known mainly from their entries in the Turin King List, and are mostly unknown elsewhere. Dates and in some cases, order of reign, are also unknown. It s unclear how the names listed in green fit in with the rest of the list, except that all but the last reigned before Bebankh, as he is mentioned in both lists. Reigned for 3 years. May be the same as Semqen. Reigned before Bebankh for 1 year? Reigned after Bebankh for 3 months? Yakbam is an Amorite name. At around the time Memphis fell to the Hyksos, the native Egyptian ruling house in Thebes declared its independence and set itself up as the Seventeenth Dynasty. This dynasty eventually drove the Hyksos out of Egypt. The last two pharaohs of the dynasty opposed the Hyksos rule over Egypt and initiated a war that would rid Egypt of the Hyksos kings and began a period of unified rule which is known as the New Kingdom. The Theban kings of the Seventeenth Dynasty locate their tombs in part of the Theban necropolis now known as Dra Abu el-Naga. They incorporate small pyramids in their building. Though the position of some tombs is known by the early nineteenth century AD, they are subsequently lost. Second son. Reigned for 5 years. Position unclear, but reigned at end of the dynasty. Egypt is freed from Hyksos rule by Kamose. Nubia is regained. With the Hyksos thrown out of Egypt and the country reunited under native rule, the descendants of the Seventeenth Dynasty pharaohs formed the Eighteenth Dynasty. Quite probably as a result of the foreign rule of the Hyksos during the Second Intermediate Period, the New Kingdom saw Egypt attempt to create a buffer between the Levant and Egypt through military dominance abroad, creating Egypt's greatest territorial gains. It expanded far into Nubia in the south, and held wide territories in the Middle East. Egyptian armies fought against Hittite armies for control of ancient Syria. Egypt also began to construct a chain of impressive forts, part of the militarisation of the Sinai (see feature link). There would be no repeat of the Hyksos invasion while Egypt was capable of ensuring that fact. The Eighteenth Dynasty had its capital at Thebes, although much of the administration probably remained at Memphis. The dynasty contained some of Egypt's most famous pharaohs including Ahmose I, Hapshepsut, Thutmose III, Amenhotep III, Akhenaten and Tutankhamun. Queen Hatshepsut concentrated on expanding Egypt's external trade, sending a commercial expedition to the land of Punt. Thutmose III ('the Napoleon of Egypt') expanded Egypt's army and wielded it with great success, militarising the eastern border and ensuring Egypt was properly defended. New Kingdom pharaohs begin the practice of burial in rock-cut tombs in the Valley of the Kings. They also immediately take control of the Canaanite city of Hazor. With the resurgence in Egyptian power, attention is turned again towards Nubia, where locals had created their own state or states during the Egyptian Intermediate Period, and now openly rebel when Tuthmosis gains the throne. A campaign south sees Nubia defeated and Egypt resumes control there. A swift campaign through Canaan and Syria follows in the pharaoh's second year. Regent and queen. Reasons for death unknown. Following the sudden, and unexpected early death of Tuthmosis II, Hatshepsut, the daughter of Tuthmosis I and half-sister and wife of the dead king, acts as regent to the infant Tuthmosis III for the first two years of her reign. He is the son of Tuthmosis II and a junior wife who is unsuitable to act as regent. In 1503 Hatshepsut declares herself pharaoh and reigns for twenty-two years in a 'Gloriana' reign equivalent to that of Elizabeth I's of England. Tuthmosis begins to permanently extend Egypt's influence in the Middle East by conquering Palestine, and Canaan and entering into Syria on the southern borders of Mitanni. Deir el-Medina is founded as a village of craftsmen responsible for Egyptian royal tombs. Tuthmosis III gains the throne and immediately sets about removing any evidence of his stepmother's reign, bricking over her obelisks in the Luxor Temple and ordering images of her and cartouches bearing her name to be chiselled off walls. Egypt is expanded to the Euphrates and the Fourth Cataract of the Nile. Tuthmosis defeats Mitanni at the battle of Megiddo. Cyprus is also brought under Egyptian control. Egypt's territories in the Levant and Syria reach up to Amurru and include Canaan. 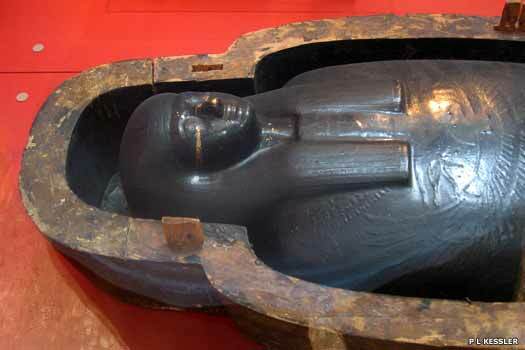 Oubensenou (also translated as Ouebsenou or Webensenu) is probably a son of Amenhotep II. His precise placing in the order of the pharaoh's children is unknown, and at least one scholar, Catharine H Roehrig, suggests that Tuthmosis III is actually his father. Dodson and Hilton state that he is a son of Amenhotep II who dies as a child and is buried with his father in tomb KV35. Peter der Manuelian refers to him as 'king's son and overseer of horses', and Betsy Bryan has suggested that he is born in the first five years of Amenhotep reign. Son. Marries daughter of the Mitanni king. Amenhotep first marries the daughter of the Mitanni king Shuttarna II, the two kingdoms then being firm allies, and later marries the daughter of a successor, Tushratta. 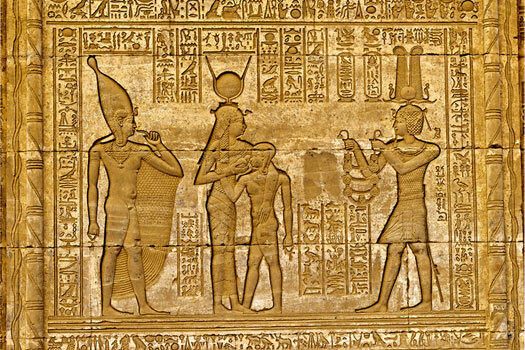 Akhenaten institutes monotheism in the fourth year of his reign with the sole worship of the sun god Aton. In the following year he founds a new capital at Amarna. Unfortunately Egypt is not yet ready to abandon its many gods and, following the pharaoh's death virtually all traces of this 'heretic' and his beautiful wife, Nefertiti, are erased from history. 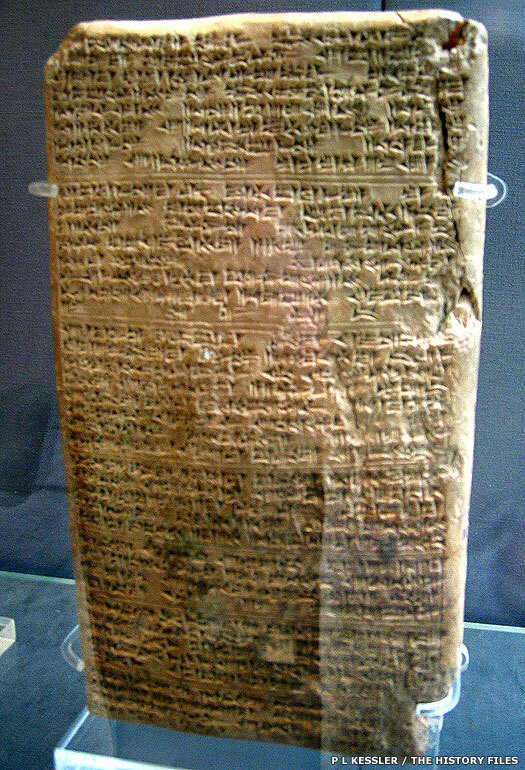 During his period of rule from there the Amarna letters are written - diplomatic correspondence with Assur-Uballit I of Assyria, the Kassite rulers of Babylonia, plus Mitanni, the Hittites, Alashiya, Arzawa, and the city states of Syria and Canaan - which includes descriptions of the disruptive activities of the 'habiru'. Son-in-law of Akhenaten (or Nefertiti renamed?). The eight year-old Tutankhamun's accession is probably handled by Ai, the priest and master of horse for Akhenaten. To ensure that no outside interests gain a foothold in what is now his power base, he chooses the boy pharaoh's elder sister to be the queen. However, Tutankhamun's comparatively brief reign is halted by a hunting accident and subsequent blood poisoning. No curse is attached to his tomb (see feature links). Following his untimely death, Ankhesenamen, his young wife, seemingly succeeds him, but his regent (and possibly her grandfather), Ai, cements his own position by marrying Ankhesenamen. Wife of Tutankhamun. Also known as Eje. Regent to Tutankhamun & Ankhesenamen? Egypt still conducts profitable trade with Damas in Syria, as witnessed by the building of a series of border fortresses as the former seeks to control the Sinai. The fortresses help to defend Egypt's trade route to Damas, which also passes through Edom and Moab at this time. Former C-in-C of Army (this is disputed). Djeserkheperure Horemheb was the last pharaoh of the Eighteenth Dynasty. After seizing back his position of designated crown prince from the 'usurper', Ai, and because he had no heir of his own, he appointed his vizier, Paramesse as his chosen successor before his death. Paramesse employed the name Ramses I upon assuming power. The Nineteenth Dynasty set about erasing the name of Tutankhamun from history. However, they did continue to use the Valley of the Kings for royal burials. One tomb was dug out just five metres away from Tutankhamun's tomb (probably not the best way of inducing complete forgetfulness of the boy pharaoh) and seven coffins were placed there, one of which contained a garland which survived for three thousand years to be discovered by archaeologists (see feature link, right). Ramses reaches a stalemate with the Hittites at the Battle of Kadesh, after which the earliest known peace treaty is signed in 1258 BC. Ramses limits his control to southern Palestine, where he draws a firm and fortified boundary. A statue erected at Luxor by Ramses II lists Mu'ab as one of a series of states conquered by him during a campaign, usually assumed to be Moab. Ramses II is known during his reign as the oppressor of the Israelites, and he may be the unnamed pharaoh of the Old Testament, but whether the well-known story of the Israelite exodus from Egypt occurs at this point in time is still unproven and highly debatable. Egyptian control over the Levant (including Canaan) gradually slips away despite large chariot-driven forces (see feature link) and supporting foot soldiers. Instead, Ramses constructs a series of forts close to the Egyptian border. In his fifth year, Merneptah claims to successfully repel an attack by Libyans and an assortment of people from the north (including a detachment of the Lukka), whom he calls 'of the countries of the sea', or Sea Peoples. They try to enter Egypt by force, but also bring their families and cattle, clearly intending to stay. In a brief addendum near the bottom of the stele which captures this glory (now exhibited in the Cairo Museum), Merneptah also mentions that Ashkelon, Gaza, and Yanoam (in the north Jordan Valley) have been captured and that Israel 'has been shorn. Its seed no longer exists'. The first two cities have probably already been captured by the invading Philistines and are therefore targets for 'rescue' by a civilised king. Israel, too, is the name given to a recently-arrived or formed group which would need to be brought to heel (although the claim that its seed no longer exists is mere boastfulness). This is the earliest definitive mention in history of a people named 'Israel'. Egypt gains overlordship of Canaan, and perhaps the Israelites and Philistines, both of which are only just settling in the region. As happened under the later Nineteenth Dynasty, this group struggled under the effects of the bickering between the heirs of Ramses III. However, at this time Egypt was also increasingly beset by a series of droughts, below-normal flooding levels of the Nile, famine, civil unrest and official corruption - all of which would limit the managerial abilities of any king. The kingdom declined, and with it, Egyptian influence outside its own borders. The power of the last king, Ramses XI, grew so weak that in the south the High Priests of Amun at Thebes became the effective de facto rulers of Upper Egypt, while Smendes controlled Lower Egypt even before Ramses XI's death. Smendes would eventually found the Twenty-First dynasty at Tanis. In fact, the whole region, from Syria and the Levant, to the Hittites in Anatolia, and Assyria and Babylonia, was at this time in the grip of a dark age resulting from the general instability of circa 1200 BC, and a new people, the Aramaeans, were migrating into Mesopotamia and Syria, exacerbating the situation. Son. Last great pharaoh. Murdered. In his fifth year (1179 BC), Ramses fights off attacks from people from the north, almost certainly the Sea Peoples. In his eighth year (1176 BC), as well as defeating another attack, he provides an overview of the general collapse in the eastern Mediterranean in the face of attacks by the Sea Peoples. The twelfth year (1172 BC) sees another attack. However, Ramses may be claiming the victories of his predecessor, Merneptah, although his statements do highlight Egypt's loss of influence outside its own borders by this date. There is a possibility that these defeated Sea Peoples include the Philistines, the defeat forcing them to settle Canaan instead. A plot to extract revenge is hatched by Tey (or Tiye), one of Ramses' wives, who has been overlooked for the position of principal wife when the pharaoh had chosen another wife, Isis. The plot results in the murder of Ramses and an armed uprising. Isis and her son, Ramses IV, defeat the uprising and the conspirators, including many senior figures, are sentenced to death. The eldest son of Tey, Pentawere, is the only one of Ramses' sons to join the uprising. He is tried and found guilty, and subsequently takes his own life. Modern CT scanning techniques have revealed that Ramses has his throat slit to kill him, and the embalmers who mummify his body embed a Horus eye in the wound, a charm that is most probably intended to promote healing. Pentawere seems to have been strangled, possibly meaning that he has someone else end his life on his orders. The process of mummification has been perfected by this point, with fashion and cost even influencing the choice of materials to use (see feature link, right). Son. Lost Philistia and part of Syria to Assyria. Partition of Egypt into the power domains of the High Priests of Ammon in Thebes and the Pharaohs in Tanis. Assyria takes complete control of Syria and Armenia from a weakened Egypt. Stripped of power by High Priest of Amun Herihor. The Onomasticon of Amenemope document appears to confirm that the former Sea Peoples, the Peleshet, Sherden, and Tjekker, are still settled in Philistia. Egypt loses control of its dominions in Nubia. End of the New Kingdom period. The Third Intermediate Period marked the end of the New Kingdom after the collapse of the Egyptian empire and the political fragmentation of the country. A number of dynasties of Libyan origin ruled, giving this period its alternative name of the Libyan Period. Based at the new Egyptian capital of Tanis (which was founded by the preceding dynasty) the Twenty-First Dynasty was a relatively weak group. Theoretically, they were rulers of all Egypt, but in practice their influence was limited to Lower Egypt. A series of Meshwesh Libyans ruled Egypt from circa 943 BC until 720 BC. They had been settled in Egypt since the Twentieth Dynasty. Although the dynasty seems to have originated at Bubastis, the kings almost certainly ruled from Tanis, which was their capital and the city in which their tombs have been excavated. 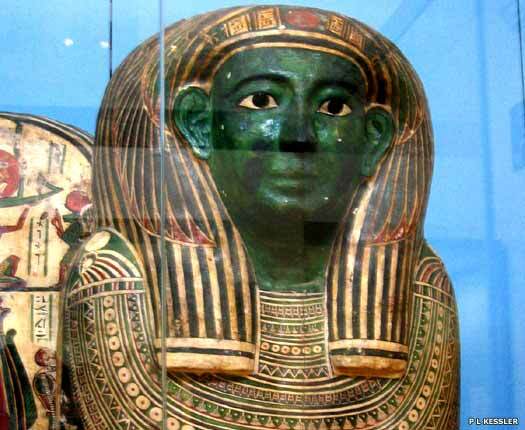 The tomb of the first, and probably most powerful of them, Shoshenq I, was discovered intact at Tanis in 1938-39. Shesonk mounts a full-scale invasion of Judah and Samaria, but concentrates his efforts mainly on the north. Jerusalem is relatively untouched following a short siege by the invaders. The Ark of the Covenant, contrary to some opinion, is not taken to Egypt. Harsiese is an independent king at Thebes who rules during the reigns of Takelot I and Osorkon II. Osorkon is a member of an alliance of states which also includes Ammon, Arvad, Byblos, Damas, Edom, Hamath, Kedar, and Samaria. Together they fight against Shalmaneser III of Assyria at the Battle of Qarqar which consists of the largest known number of combatants in a single battle to date, and is the first historical mention of the Arabs from the southern deserts. Despite claims to the contrary, the Assyrians are defeated, since they do not press on to their nearest target, Hamath, and do not resume their attacks on Hamath and Damas for about six years. At the start of Shoshenq's reign, a separate group of Libyans in Leontopolis gains power over the Middle and Upper Egypt area. By 805 BC a further group, the Libu, gain the western Delta around Sais. Shoshenq IV is not to be confused with Shoshenq VI - the original Shoshenq IV in publications before 1993. In Nubia, the kingdom of Kush is founded on Egypt's southern borders. Very soon the Nubians there are in a position to challenge for the control of Egypt itself. Osorkon IV ruled concurrently from the eastern Delta with Tefnakhte of Sais and Iuput II of Leontopolis. The so-called Twenty-Third Dynasty was a localised offshoot of the previous one, again of Libyan origin, which was perhaps based in Upper Egypt, though there is much debate concerning this issue. All of its kings reigned in Middle and Upper Egypt including the Western Desert Oases, while another group of Libyans, the Libu, occupied the western Delta. The capital was located at Leontopolis. 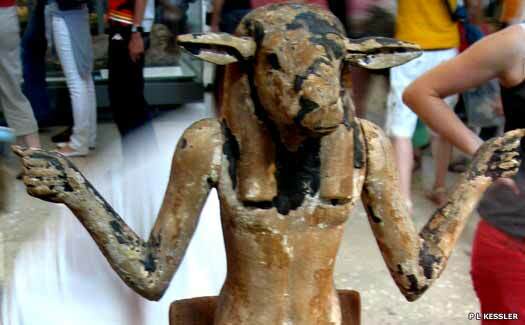 Previously thought to be a 22nd Dynasty pharaoh. A rebel who seized Thebes from Takelot II. Son of Takelot II. Recovered Thebes and took throne. Not counted as forming a dynasty as such, the Libu were yet another group of western nomads (Libyans) who occupied the western Delta from Sais. The Late Period runs from 732 BC until Egypt became a province of Rome in 30 BC, and includes the last flowering of native Egyptian rulers before periods of rule by various foreigners: Nubians, Persians, and Macedonians. A short-lived group of pharaohs who had their capital at Sais in the western Nile Delta, the dynasty came to a sudden end. The authority of the second pharaoh was recognised in much of the Delta, including Memphis, but Shabaka, the second king of the Twenty-Fifth Dynasty, attacked Sais, captured Bakenrenef and burned him alive. Egypt is conquered by Ethiopians/Nubians. While the Twenty-Fourth Dynasty pharaohs attempted to rule from Sais, Nubians from the kingdom of Kush (with perhaps Ethiopian overlordship) invaded from the south and swiftly took over Egypt. The second of their pharaohs cleared the way for their complete rule of Egypt. Control was probably indirect, with local Egyptians in charge of administration. They originated in Kush (now in northern Sudan) at the city state of Napata, from where they invaded and took control of Egypt under Piye (spelt Piankhi in older works). From Taharqa's reign onwards, the kings of this dynasty were driven back into Nubia, at first by the Assyrians, then by the pharaohs of the Twenty-Sixth Dynasty. Their successors settled back in Nubia, where they re-established their Kushite kingdom at Napata (c.750-590 BC) and then moved it to Meroë (590 BC to the fourth century AD). King of Nubia (747-721 BC). King of Nubia (721-707 BC). King of Nubia (707-690 BC). Nephew of Sabaka. King of Nubia. Assyrian king Ashurbanipal re-invades Egypt, although he is delayed by a rebellion of the Nile Delta vassals. Using an army made up of units from Syro-Palestinian vassals such as Cyprus, Edom, Judah, Moab, and Phoenicia, the Kushites are expelled. One of the Nile Delta vassals, Neko, is reinstated and given special prominence. When Assyria's army departs, the new king of Nubia, Tantamani, returns to take control. King of Nubia (664-653 BC). The Assyrians return with a major attack which reaches Thebes. Nubian influence in Egypt is brought to an end. The Saite pharaohs were the last native dynasty to rule Egypt before the Persian conquest (although others followed). They had their capital at Sais, and also founded the city of Herakleion around this time. Following the fall of the Assyrian empire, Egypt attempted to reassert its former control in the Middle East, but was driven back by the Neo-Babylonians although they were prevented from entering Egypt itself. However, the Persian empire swept away all before it, Babylonians and Egyptians alike. A descendant of this dynasty eventually led the battle for the liberation of Egypt. Assyrian vassal. 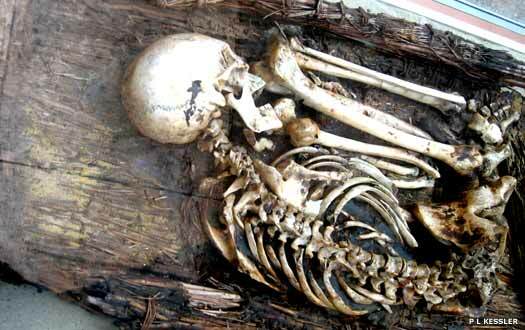 Killed by Tantamani of Kush. The pharaohs of the twenty-sixth dynasty reopen the Fifth Dynasty necropolis at Abu Sir to begin their own internments there. By 663 BC they feel sufficiently strong to throw off Assyria's vassalage and Psamtik declares himself pharaoh of all Egypt. Son. Expelled the Syrians in 655 BC. A Jewish community has become established on the island of Elephantine in the middle of the Nile close to Aswan. Initially made up of settled mercenaries, it now appears to swell with an influx of Israelites probably leaving their homeland to escape the fervent paganism of their king, Manasseh. The enlarged population, living alongside Egyptians on the island, builds a Temple matching that of Solomon's in dimensions and scale. Egypt frees herself from the Assyrians, and in 605 BC attempts to prevent the westward expansion of Babylonia, but is expelled from Syria. Psamtik sends an army south to fight the Kushites and the king of the Ethiopians. Some deserters remain in Western Abyssinia and settle there, according to Herodotus' Land of the Deserters. Using Greek mercenaries, Babylonians are held off. The Libyans seek an alliance with Egypt in order to punish the flourishing and expanding Greek colony of Cyrene. The Egyptian troops who are sent by Pharaoh Apriês are wiped out by the Cyrenaeans at the Battle of the Well of Thestis, almost to a man due, according to Herodotus, to not taking the Greeks seriously as an opponent. The Greeks form an alliance with the successor of Apriês. Died on the eve of the Persian invasion. Son. Carried to Susa in chains. Psamtik III is defeated at the Battle of Pelusium and Egypt is conquered by the Persian empire under Cambyses. It becomes a vassal state (a burial just before this defeat is detailed in the feature - see link). Many Egyptian temples are destroyed, but Cambyses spares the Jewish Temple on Elephantine. However, it seems that Psamtik is not immediately captured. Instead he, or the bulk of his forces, seek refuge around the Dachla Oasis. Cambyses follows him with an army of 50,000 men and, according to Herodotus, the entire army disappears in the desert, presumably overcome by a sand storm (around 524 BC). A highly favourable modern theory is that this story is created by Cambyses' successor to mask an embarrassing defeat. In this theory, Psamtik manages to reconquer a large part of Egypt and is crowned pharaoh in the capital, Memphis. It is Cambyses' successor in Persia, Darius I, who ends the Egyptian 'revolt' with a good deal of bloodshed two years after Cambyses' defeat, in 522 BC (or 521 BC). Egypt was conquered by the Persian empire under Cambyses in 525 BC and annexed as a great satrapy until 404 BC. This was not without a hiccup, as Cambyses was seemingly defeated by the now-rebel Saite dynasty Pharaoh Psamtik III, who enjoyed a brief resurgence before finally being crushed by Darius I. The Achaemenid kings were acknowledged as pharaohs in this era, forming a twenty-seventh dynasty, although in their administrative terms, it was an official satrapy or province. According to the Behistun inscription of Darius the Great, it was called Mudrāya (or Mudraya without the accented letter), a Persian interpretation of the earlier Misir. According to Egyptians themselves the land was kmt, transliterated as Kemet, meaning the 'black land', a reference to the rich, dark soil near the Nile. The people were the 'remetch en kemet', literally meaning 'people of the black land'. Gaining Egypt also meant gaining Cyprus, as it seems to have been under Egyptian control for the previous half century. In fact, Herodotus mentions the Cypriots submitting voluntarily and sending ships to aid Cambyses. The Libyans sent tokens of submission, as did the Greek cities of Barka and Cyrene. Arabia around the oasis of Taymāʾ, which had belonged to the Babylonian empire, was only won for Persia during Cambyses' Egyptian campaign and was added to the great satrapy of Egypt. Nubia was also added as a main satrapy under Egypt's oversight, although evidence of anything more than a partial incursion into that region is not available. In Egypt itself, Psamtik was allowed to retain much of his authority as satrap, but he dabbled in political intrigue and was quickly replaced by Aryandes. Former Saite pharaoh of Egypt. Arrested and executed. Persian satrap of Egypt. Executed by Darius I. After dealing with a usurper at home, Darius the Great becomes the first official twenty-seventh Persian dynasty pharaoh of Egypt after the death of Cambyses, who appears to have spent much of the last years of his reign in Egypt. Darius also conquers Cyrene in Libya and exacts tribute from Nubia. The symbolic tomb of Osiris is laid beneath the pyramid of Khafre. It is surrounded by the remains of four pillars which are built in the shape of a hieroglyphic 'House of Osiris'. All is not well in Egypt. Rebels from Nubia are a constant threat to caravans and barges, necessitating guards to be posted on the more important transports. In the autumn, Egypt revolts, known as the First Rebellion. The satrapy, previously happy with the rule of Darius, is far less so now in the twilight of his reign, with the burden of tribute and Persian exploitation seemingly increasing. With Darius dead at the end of 486 BC, it falls to his son, Xerxes to deal with the situation. Afterwards, Xerxes installs his brother, Achaemenes, as satrap. Son of Darius I. Persian satrap of Egypt. Killed. Achaemenes is killed at the Battle of Pampremis in 460 or 459 BC. His opponents are Inarus (or Inaros), son of a Psamtik and leader of the Second Rebellion in Egypt, and his Athenian allies. It is generally assumed that Psamtik is a member of the dispossessed Saite dynasty. The Greek threat is finally ended in 454 BC when Megabyzus, former satrap of Ebir-nāri, arrives with a fresh army. Inarus is hauled off to Susa where he is reported to be crucified. With Persian influence weakening in Upper Egypt, the Egyptians on Elephantine destroy the Jewish Temple, convinced the Jews have been collaborating with the occupying power. The Jewish community is forced to leave. It seems that they move to Western Abyssinia, in Ethiopia, where they flourish. With the death of Darius II, Egypt is liberated from Persian rule by the twenty-eighth dynasty pharaohs. This was a short-lived dynasty consisting of only one pharaoh. Amyrtaeus was a descendant of the Saite pharaohs of the Twenty-Sixth Dynasty who led a successful revolt against the Persians. Correspondence between the Jews at Elephantine and Jerusalem ceases. According to an account preserved on papyrus, Nefaaryd founded the dynasty by defeating Amyrtaeus in open battle, and later put him to death at Memphis. Nepherites made his capital at Mendes. On the death of Nepherites, two rival factions fought for the throne: one behind his son Muthis, and the other supporting the usurper Psammuthes. Although the latter was successful, he only managed to reign for a year before he, too, was overthrown. Son. Defeated by his rival, Psammûthis. A dynasty which lasted nearly twice as long as the preceding one, it was started when Nekhtnebef deposed Nefaarud, but he spent much of his reign defending the country from Persian incursions. The recent spate of usurpations did nothing to make that task any easier. Ariobarzanus, satrap of Phrygia, and Datames, satrap of Cilicia and Katpatuka, are in revolt against Persian King Artaxerxes II. Autophradates, satrap of Sparda, has been ordered to suppress the rebellion and he has already managed to expel Ariobarzanes from the greater part of his satrapy. Now Sparta, and also Pharaoh Takhôs, send substantial help to the rebels. Two years later, in 360 BC, Ariobarzanes is betrayed by his son, Mithridates and is executed. Nekhtharehbe becomes overconfident about his successes in protecting Egypt from Persian attack. After sixteen years of success he takes command of the mixed Greek-Libyan-Egyptian army in person. This proves to be a mistake as he bolts for Memphis when a division of his Greek mercenaries are defeated by a surprise landing by Persian mercenaries. His army, and then one by one his cities all come to terms with the Persians and Egypt is again an occupied territory. Egypt was briefly re-conquered by the Persian empire under Artaxerxes III, marking the end of around three thousand years of mostly native rule. Nevertheless, the process of reconquering Egypt started in 374 BC but by now the Egyptians knew how to defend themselves and this campaign failed. Diodorus describes the process of reconquest but is not clear. There may be several campaigns involved, seemingly so catastrophic in their outcome as to incur universal ridicule. The situation grew so bad that even the Levant rebelled briefly. Once back in place, the Persian kings ruled in absentia through their satrap, exploiting Egypt's vast grain reserves and taxing its people. The Persians showed relatively little respect for the ancient traditions and were deeply unpopular. In fact the Egyptians' rebelled so often that parts of the country remained virtually independent. The Persians rule Egypt direct from the centre of their empire. For the last two of these years they only have power in Lower Egypt. Leader of a Nubian revolt in Upper Egypt. King Nastasen of Meroë records on an inscription the fact that he has defeated one 'Kmbswdn' somewhere north of Meroë. This has occasionally been equated with the Persian king, Cambyses II, but his death in 522 BC makes this impossible. Nastasen speaks as if his opponent's territory could be overrun, which would hardly be true of lands within the Achaemenid empire. However, Khabbabash, leader of the Nubian revolt in Egypt has claimed Upper Egypt, which may make him a perfect candidate. The revolt of Khabbabash is ended by 335 BC, and Upper Egypt is returned to Persian control. Persian satrap of Egypt. Died at Issus. Sabaces joins Darius III at the Battle at Issus against the Macedonian Greeks. Although outnumbered two-to-one, the Greeks are victorious and Sabaces is killed. Persian satrap of Upper Egypt? Alexander the Great's forces arrive in Egypt in October 332 BC. With Satrap Mazaces having no means of defending the region now that Darius III had fled eastwards, he simply hands over the satrapy intact, without a fight, and it now falls under the control of the Greek empire. The city of Alexandria is founded by Alexander and Mazaces is reappointed to the post of satrap. The Argead were the ruling family and founders of Macedonia who reached their greatest extent under Alexander the Great and his two successors before the kingdom broke up into several Hellenic sections. Following Alexander's conquest of central and eastern Persia in 331-328 BC, the Greek empire ruled the region until Alexander's death in 323 BC and the subsequent regency period which ended in 310 BC. Alexander's successors held no real power, being mere figureheads for the generals who really held control of Alexander's empire. Following that latter period and during the course of several wars, Egypt was left in the hands of the wily General Ptolemy from 305 BC, founder of the Ptolemaic dynasty. Satrap of Egypt. Formerly the Persian satrap. What happens to Mazaces after 332 BC is unknown. It is possible that he continues as satrap of Egypt until Ptolemy takes over the role in 323 BC. It is also possible that he is deposed by the avaricious Cleomenes of Naucratis, nomarch of the Arabian district of Egypt to the east. Cleomenes certainly establishes an expansion of his governance to include Egypt and, by 323 BC is so dominant that he is put to death by Ptolemy. Satrap of Arabian Egypt. Soon dominant over all of Egypt? Satrap of Egypt. Became pharaoh in 305 BC. 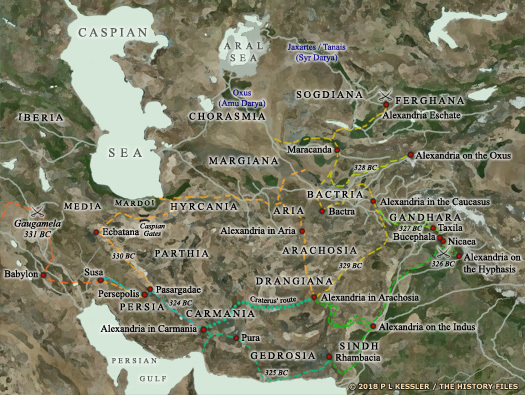 The Wars of the Diadochi decide how Alexander the Great's empire is carved up between his generals, but the period is very confused, especially in the east. These provinces appear to be invaded and controlled by the Antigonids for a period. Egypt, however, is firmly and safely in the hands of General Ptolemy. From his base he launches several campaigns which help to decide the outcome of the various wars. These wars rumble on until the end of the century, but Ptolemy is already firmly established in Ptolemaic Egypt. The Ptolemaic dynasty was an Hellenistic royal family which ruled in Egypt and Cyrene for nearly three hundred years. Ptolemy, the Macedonian son of a nobleman called Lagus and one of Alexander the Great's closest generals, was accepted as satrap of Egypt (which included Judah) after Alexander's death in 323 BC. Apparently he understood the fragile nature of the empire and opted for a single, defendable part of it rather than voluntarily take part in the squabble to control it all. The unity of Alexander's great empire quickly fragmented as the generals competed with each other for more power and territory. When Antigonus (of Greater Phrygia) proclaimed himself king in 306 BC, all the other surviving generals matched his proclamation, confirming the dismantling of the empire into regional domains. Ptolemy later had the epithet 'Soter' (saviour) added to his name, and gained Cyprus and Phoenicia in 301 BC. The Egyptians soon accepted the Ptolemies as the successors to the pharaohs of an independent Egypt. The process was greatly helped by Ptolemy's respect for and understanding of Egyptian tradition, not that he wasn't capable of ignoring anything that didn't suit his purposes. They were sometimes opposed by native uprisings, however, and even respect for Egyptian culture couldn't entirely remove the vague taint of their being foreigners. Thanks to the name of Ptolemy Soter's father, the dynasty was also known as the Lagides. It was characterised by complicated political in-fighting between various claimants, with two or more of them often sharing power. The Ptolemies were also well known for their somewhat incestuous familial relationships, with many of those claimants often being related through birth or marriage (or both!). When they weren't fighting each other, more complicated political and actual warfare often took place with and against the other Greek kingdoms and empires across much of the ancient world, until all of them were diminished by the constant strife and Rome had overtaken them in terms of power and influence. General in Alexander's Greek army. Abdicated. Died 283 BC. Second wife and co-ruler. Died 279-265 BC. Generally avoiding the sometimes chaotic warfare of the Wars of the Diadochi, Ptolemy Soter instead concentrates largely on internal Egyptian achievements. He transfers his seat from Memphis to Alexandria, which is still under construction. A royal palace, the Serapis temple, and the musaeum (the temple of muses) are all built, along with a large library in which is gradually concentrated a magnificent collection of Greek literature. The new city of Ptolemaida Hermiu is founded in Upper Egypt, and the canal between the Nile and the Red Sea is restored. In the last years of his reign he oversees the construction of the famous lighthouse of Alexandria on the island of Pharos in front of Alexandria's harbour. Daughter of Lysimachus of Lysimacheia. Wife and co-ruler. Ptolemy Ceraunus is the elder brother of Ptolemy Philadelphus (or to be more accurate, half-brother, by Ptolemy Soter's first wife). He becomes King Ptolemy II of Macedonia and Lysimacheia after marrying his half-sister and the widow of Lysimachus, Arsinoë (II). Then he kills two of Arsinoë's sons for conspiring against him (as had their mother), and Arsinoë flees to Egypt for protection with her full brother, Ptolemy Philadelphus. When in Egypt, it would appear to be Arsinoë II who frames Arsinoë I with plotting against Ptolemy Philadelphus. Arsinoë I is divorced and banished and Ptolemy marries his sister instead, establishing a tradition of incestuous pharaonic relationships. Widow of Lysimachus of Thrace. Sister-wife of Ptolemy II. Magas, governor of Cyrene, after several attempts following the death of his stepfather (Ptolemy Soter), crowns himself king. In 274 BC he attacks Egypt, but has to call off his planned invasion thanks to a revolt of the native Libyan Marmaridae. The remainder of Magas' rule is concerned with maintaining his kingdom's independence, but following his death, Cyrene is almost immediately captured by Ptolemy Philadelphus. Egypt backs a coalition of Greek city states in the Chremonidean War which include Athens and Sparta, who are fighting for the restoration of their independence from Macedonian influence. They are aided by Ptolemy Philadelphus, who is naturally threatened not only by Antigonus' apparently peaceful rule of Greece, but by his friendship with the Seleucid empire. He temporarily loses control of most of the Greek city states to the south but, by 263 BC, has worn down both Athens and Sparta. Order is temporarily restored in Greece. The interference by Ptolemy Philadelphus continues in Greece, triggering the Second Syrian War. Antigonus II of Macedonia and Antiochus II of the Seleucid empire team up to combine their attacks. Egypt loses ground in Anatolia and Phoenicia, and is forced to cede lands which include its ally, the city of Miletus. Son of Ptolemy II & Arsinoë I.
Ptolemy Euergetes declares war on Seleucus II of the Seleucid empire and enjoys a great deal of success on campaign as a continuation of the Third Syrian War. Following major victories in battle he briefly occupies Antioch and also Babylon. Secure away from the coastal regions, Seleucus is distracted by his domineering mother, who forces him to accept his younger brother, Antiochus Hierax, as a co-regent and governor of regions in Anatolia. Antiochus immediately declares the independence of Antioch, and Seleucus has to sue for peace with Ptolemy in 241 BC. Egypt gains more Seleucid territory along Syria's northern coast (including Seleucia Pieria), and around this time or the following year, 240 BC, Lycia comes under Ptolemaic control. Dau of Magas of Cyrene. Wife and co-ruler. Murdered. Sister-wife and co-ruler. Murdered as soon as Ptolemy died. The Fourth Syrian War involves Antiochus III of the Seleucid empire fighting Ptolemy Philopator for control of their mutual border. Antiochus recaptures Seleucia Pieria, Tyre, and other important Phoenician cities and their Mediterranean ports, but is fought to a draw at Raphia on Syria's southernmost edge. The subsequent peace treaty sees all the gains other than Seleucia Pieria relinquished. Ptolemy's arming of Egyptians for his Syrian campaign has had an alarming and unforeseen effect. Suddenly (although probably after a few years of increasing rebellion from around 207 BC) Upper Egypt founds its own independent pharaonic kingdom. Two pharaohs command the breakaway region for around two decades. The first is Hugronaphor, known by an astonishing number of variations, including Harmachis, Haronnophris, Herwennefer, Horwennefer, Hurganophor, and Hyrgonaphor - the latter being Greek). He may be of Nubian origin. Rebel pharaoh of Upper Egypt. Dead by 197 BC. Son of Ptolemy IV. Acceded aged 5. To achieve his part of a treaty with Philip V of Macedonia that is designed to carve up Egypt's colonial possessions, Antiochus III of the Seleucid empire invades Coele Syria. This triggers the Fifth Syrian War and sees Ptolemaic General Scopas defeated at Panion near the source of the River Jordan in 200 BC. This gains Antiochus control of Palestine and Phoenicia. The campaign ends in a peace deal in 195 BC which gains for Antiochus permanent possession after a century of fighting of southern Syria (which includes Idumaea, while Ammon breaks away from the empire), and also of Egyptian territories in Anatolia (which include Lycia). In return Antiochus gives his daughter, Cleopatra, in marriage to Ptolemy Epiphanes, which is now little more than a Seleucid protectorate. Wife of Ptolemy V. Regent for Ptolemy VI until he matured. Ankhmakis has succeeded Hugronaphor as the native pharaoh of Upper Egypt, and has managed to seize as much as eighty percent of the entire land of Egypt, primarily through guerrilla warfare (the Greeks would record military battles, but these are conspicuous by their absence). However, around 186-185 BC, Ankhmakis is finally captured. Ptolemy's General Komanos (Conanus in Greek) takes him, apparently with the help or contrivance of the priestly caste. Son. Lost true power to Ptolemy VIII. Restored 163 BC. Sister-wife. Later co-regent (163 BC). 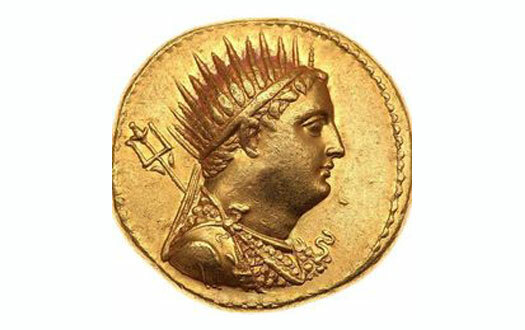 m Ptolemy VIII (142 BC). During the recent usurpation period within the Seleucid empire, Egyptian had taken advantage by laying claim to Coele Syria, Palestine, and Phoenicia. Both parties had appealed for help to Rome, showing how degraded their own sense of authority has become. The situation is not resolved by 170 BC so Antiochus mounts a pre-emptive attack on Egypt, triggering the Sixth Syrian War (170-168 BC). Pelusium is taken after the first battle and much of Egypt is occupied in 169 BC, apart from Alexandria. Rather than attempt to depose the child-king Ptolemy Philometor and anger Rome, Antiochus installs himself as his guardian or regent. Brother. Co-regent. Proclaimed pharaoh by the Alexandrians. While Antiochus IV of the Seleucids refuses to support Perseus of Macedonia in the Third Macedonian War, urged on by the citizens of Alexandria, the siblings of Ptolemy Philometor - Ptolemy Euergetes and Cleopatra II - form a rival government. Ptolemy Philometor joins them and the war is reignited. Early in 168 BC, Antiochus captures Cyprus from them and re-invades Egypt, but the defeat of Perseus allows Rome to order Antiochus out of Egypt. Humiliated, he does so, but maintains his territorial holdings outside of Egypt. Upon being deprived of the throne following his brief usurpation of it, Ptolemy Euergetes claims the throne of Cyrene with Roman backing. He retains this throne throughout the rest of his life, even during two further periods of rule in Egypt. Ptolemy Philometor regains his throne in Egypt and again co-rules with his sister-wife, Cleopatra II. Restored. Died in unknown circumstances. Co-regent again. Married Ptolemy VIII after the death of VI. The unexpected death of Ptolemy Philometor prompts his sister-wife, Cleopatra II, to proclaim their son as his successor as although Ptolemy Neos Philometor is something of a mystery figure. He does seem to be a co-regent but the title may be honorary only, without him exercising any actual power. Ptolemy Euergetes Psychon soon regains the throne for himself, and agrees to power-share with Cleopatra II as his co-regent (his epithet 'psychon' means 'fat'). He and Cleopatra are married in 142 BC, while he also marries Cleopatra III as soon as she is of marriageable age. Son of Cleopatra II. Proclaimed co-ruler by his mother. Cousin-wife of Ptolemy VIII. Led revolt against him in 131 BC. Cleopatra II makes the most of an Alexandrine revolt against her cousin-husband, Ptolemy Euergetes. he and Cleopatra III flee to Cyprus while she is left in sole command in Egypt. Ptolemy Memphitis is the son of both parties, named after the location of his birth. He is proclaimed pharaoh by Cleopatra II. Ptolemy Euergetes still manages to have him killed and cut into quarters, with the remains being sent to Cleopatra. Civil war ensues, along with a general collapse of central government. Sole ruler with decreasing power. Son. Proclaimed by Cleopatra II. Killed by Ptolemy VIII. Ptolemy Euergetes has seized all of Egypt except Alexandria, which remains loyal to Cleopatra until its fall in 126 BC. In 128 BC, Seleucid ruler Demetrius attempts to intervene in the Egyptian civil war, supporting Cleopatra II, mother of his first wife, Cleopatra Thea, but he is defeated near Pelusium. 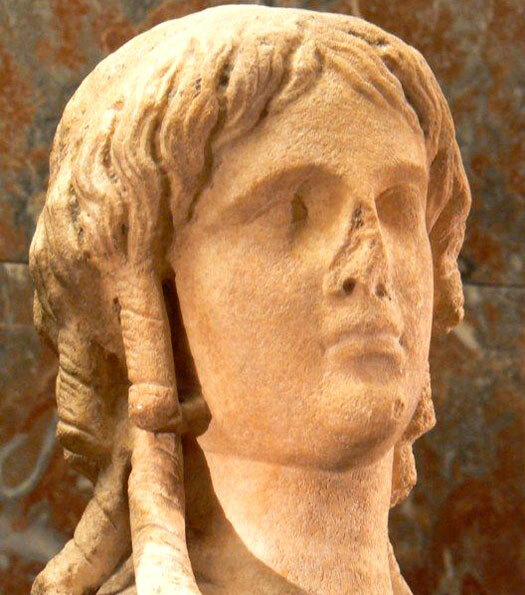 Cleopatra Thea herself succeeds Demetrius as the Seleucid ruler, serving as regent for her son, Seleucus V.
Restored in opposition to Cleopatra II. Senior ruler in 126 BC. Restored with Ptolemy VIII. Senior ruler in 116 BC. Reconciled with Ptolemy VIII. Co-ruler. Died of natural causes. The death of Ptolemy Euergetes ends a highly eventful and unsettled period of Ptolemaic history in Egypt. His nominated successors are Cleopatra III and one of her sons, with the choice of which of them being hers. She prefers the younger of them, Alexander, but the Alexandrines want Philometer Soter, current governor of Cyprus. She reluctantly complies, and Philometer becomes Ptolemy IX, while Alexander takes his place on Cyprus. Former co-ruler. Now senior pharaoh. Murdered by Ptolemy X. Son of Ptolemy VII. Co-ruler. Briefly m to Ptolemy IX, ejected by Cleopatra III. Killed 112 BC. Replacement sister-wife to Ptolemy IX. Antiochus IX, a son of Cleopatra Thea and her marriage to Antiochus VII, attempts to seize the Seleucid throne. He gains an army in 115 BC when he marries Cleopatra IV, who has just learned that her husband, Ptolemy Soter, has divorced her. He revolts against his half-brother, occupying southern Syria. In 112 BC Antiochus VIII defeats his opponents, and Cleopatra IV is captured and killed. However, later in the same year Antioch is again in the hands of Antiochus VIII. Both Seleucid rulers now find allies (or further allies) in Egypt, with Antiochus VIII being joined by Ptolemy Alexander, governor of Cyprus, and Antiochus IX being supported by Ptolemy Soter Lathyros. 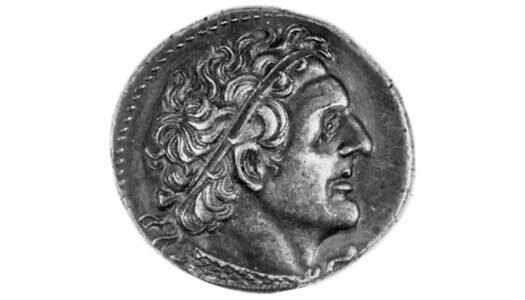 The Seleucid civil war continues through 111-109 BC, with a sideshow taking place when Antiochus IX and Ptolemy Soter become involved in supporting the Samarians against the Hasmonaean leader, John Hyrcanus of Judea, until Rome intervenes on the side of the Jews and against Antiochus IX and the Samarians (of the former northern Jewish kingdom of Samaria). Having tired of him, in 110 BC, Cleopatra III deposes and expels Ptolemy Soter in favour of her preferred co-ruler, Alexander, as Ptolemy X Alexander I. He seemingly remains governor of Cyprus at the same time, which is useful as he is deposed in 109 BC by Cleopatra who continues the merry-go-round of favourites. Ptolemy Lathyros' current sister-wife, Cleopatra Selene, is sometimes referred to as Cleopatra V, but not universally (thereby placing all subsequent numbering for Cleopatras into some confusion). She may marry his successor in 110 BC, although this is not certain. Son of Ptolemy IX. Also governor of Cyprus. Expelled. Restored by Cleopatra III. Expelled by her. Restored by Cleopatra III. Seized throne and killed her. Seleucid King Antiochus VIII marries Cleopatra Selene (daughter of Egypt's Ptolemy Euergetes Psychon). His civil war has largely dimmed by now, and he himself dies of natural causes in 96 BC. In order to finalise the last act of the civil war, his wife marries Antiochus IX. Now sole ruler. Killed in battle. Restored as sole ruler. Died. Dau. Former niece-wife of Ptolemy X. Murdered by Ptolemy XI. 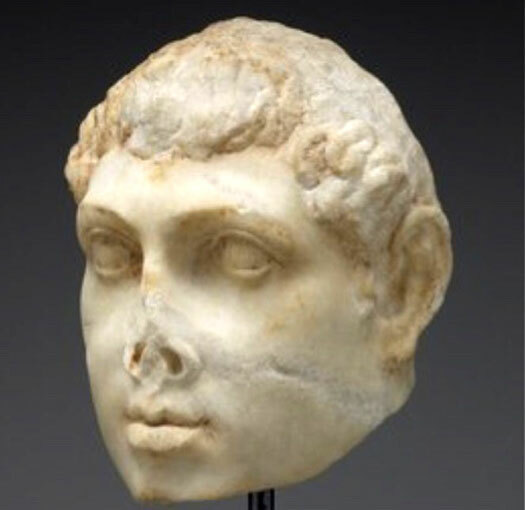 Young son of Ptolemy X Alexander. Installed by Sulla. Lynched. Sole ruler of Egypt and former consort of Ptolemy Alexander I between 107-88 BC, Berenice III is forced to marry her nephew, Ptolemy Alexander II, and then is murdered on his orders just nineteen days later. Installed by Sulla of Rome, Ptolemy Alexander II himself rules for just eighty days before being lynched to death by his subjects for killing the popular Berenice. To ensure continuity of succession and also civil order, Egyptian nobles invite two of Ptolemy Lathyros' illegitimate sons to return from exile in Pontus. The eldest takes the throne as Ptolemy Auletes while the younger (seemingly) becomes king of Cyprus rather than governor (all that is now left of Egypt's former empire). The succession is even more important than usual because Ptolemy Alexander II has willed Egypt to Rome, although the Senate is unwilling to take it on. Illegitimate son of Ptolemy IX. A weak ruler. Driven out. (Half(? )-)sister-wife and co-ruler. Mother of Berenice IV. Daughter & co-ruler. Quite possibly Cleopatra Tryphaena herself. Ptolemy of Cyprus has made the mistake of angering Rome by not gaining its confirmation of his position as king and also by not aiding Publius Clodius Pulcher when he is captured by Cilician pirates. Pulcher becomes tribune in 58 BC, and uses Roman law to drive out Ptolemy and create a Roman province from Cyprus. Ptolemy refuses to submit despite being completely unprepared to resist a Roman invasion, and instead commits suicide. Back in Egypt, the lack of response by Ptolemy's brother encourages a popular revolt which drives him out. Dau of Ptolemy XII. Senior ruler (sole ruler from 57 BC). Killed. Mother (or possibly sister) and co-ruler. Died. Ptolemy Auletes regains his throne by paying Pompey's supporter in Rome, Aulus Gabinius, to lead a force which defeats Egypt's frontier forces, marches on Alexandria, and captures the city when the guards surrender without a fight. One of his first acts is to have Berenice and her supporters executed. The core of Gabinius' men, two thousand of them, remain in Alexandria as the Gabiniani, ensuring the pharaoh's security but also ensuring that he remains loyal to Rome and compliant with its wishes. Restored. Shared power briefly with daughter. Died. Daughter and senior ruler. Suicided. Brother. Often in dispute with Cleopatra. Drowned. Civil war erupts between Julius Caesar and Pompey as the former crosses the Rubicon. Rome's various allies and subject peoples take sides, including the Getae who side with Pompey. Defeated at the Battle of Pharsalus in 48 BC, Pompey flees to Cleopatra VII, but Ptolemy XIII has him executed. 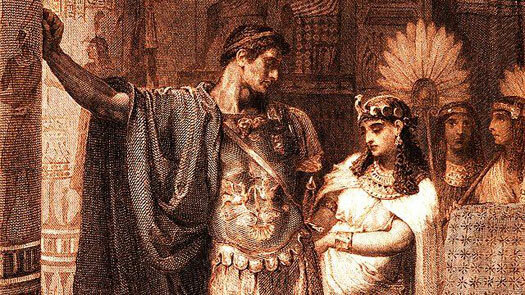 The Ptolemies have been engaged in their own civil war as Cleopatra and Ptolemy enjoy one of their frequent falling outs. Having followed Pompey to Alexandria, Julius Caesar attempts to reconcile the two. Ptolemy besieges both him and Cleopatra at the royal palace. Sister. Sided with Ptolemy XIII in opposition to Cleopatra VII. Reinforcements arrive in the form of Mithradates of Pergamum. Caesar leaves a small garrison in Alexandria and hurries with the rest of his own 4,000 men to join him at the Nile delta. By this time Ptolemy has been joined by another sister, Arsinoë, and the two engage Caesar at the Battle of the Nile. Heavy fighting follows for a time, until the Egyptians break and flee. Ptolemy is reported to be drowned when his vessel capsizes. Arsinoë is captured and sent to the Temple of Artemis in Ephesus (Anatolia). Caesar remains in Cleopatra's company for a further two months and she twice visits him in Italy, in 46 BC and 44 BC. Brother-husband of Cleopatra VII. Murdered. With Julius Caesar having been assassinated, Cleopatra tries and fails to have their son, Caesarion, named as his successor. Instead, she returns home and has Ptolemy XIV murdered so that Caesarion can take his place as her co-ruler. Son of Cleopatra VII & Julius Caesar. Murdered. The ongoing power struggle in Rome between Marcus Antonius (Marc Antony) and Octavian has led Cleopatra to side against Octavian, Caesar's heir in preference to her own son. She meets Marc Anthony at Tarsos in 41 BC and the two embark on an affair which eventually produces three children. On Cleopatra's instigation, Antony also has Arsinoë IV murdered on the steps of the Temple of Artemis. The act outrages and scandalises Roman society. The agreement regulating the Roman Triumvirate has expired, and in the political manoeuvring that follows Octavian gains and reads out Antony's will in public. It shows that his heart belongs to Cleopatra and Egypt, thereby making it clear to most Romans that Antony could never be one of them. The Senate declares war, and Octavian and Antony clash on 2 September 31 BC at the naval Battle of Actium, off the western coast of Greece. Antony is defeated as Cleopatra departs with the surviving fleet and he commits suicide. Twins of Cleopatra VII & Marcus Antonius. Cleopatra is a short-lived ruler of Cyrene. Both allowed to live after 30 BC. Brother. Died en route to Rome? Octavian invades Egypt and Cleopatra, fearing captivity and humiliation in Rome, commits suicide. Egypt and Libya become Roman provinces. Sixteen year-old Ptolemy Caesarion, the son of Julius Caesar, is presumably killed on the orders of the soon-to-be emperor of Rome. His half-siblings, the three children of Cleopatra and Marc Antony, are shipped off to Rome to be adopted, generously, by Octavia Minor, Antony's former wife. Ptolemy Philadelphus is not mentioned in Rome, suggesting that the young boy may not survive the sea voyage. Cleopatra Selene is eventually married of to the Berber King Juba II of Mauritania. While mummies of Egyptian dignitaries are being entombed at Bawiti between 30-1 BC (see feature link), Egypt is being reorganised as a Roman province, becoming a highly important grain supplier to the new Roman empire. The Sinai peninsula remains to be conquered by Emperor Trajan. The country is generally at peace (something that could not be said for the rule of the Ptolemies), but uprisings against Roman rule are experienced in AD 292 or 293. Another uprising in 296 is led by Domitius Domitianus, a would-be emperor. He dies in December 297 and Egypt is divided into several provinces which eventually fall under the control of the Eastern Roman empire. In 639 Egypt is conquered by the Islamic empire, and Islamic Egypt is controlled directly by the caliphate.